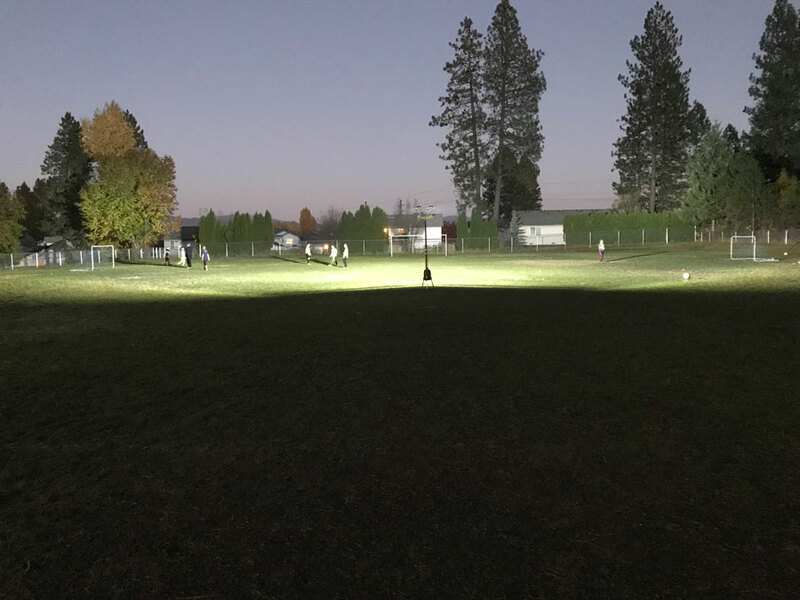 James took our remote area lighting units, called All-Terrain Lentry® Portable Light Systems, to his son’s youth soccer practice and determined, once and for all, that they’re GREAT solutions for lighting soccer fields, football fields, and other sporting practices. This picture shows Model 2TWSPX-C lighting a soccer practice. 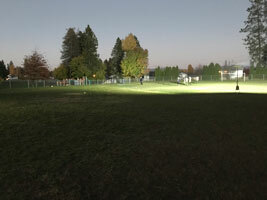 The same output would be achieved with models having two V-Spec LEDs. Many of our clients wish to extend team practices in fall and winter when daylight hours are limited. 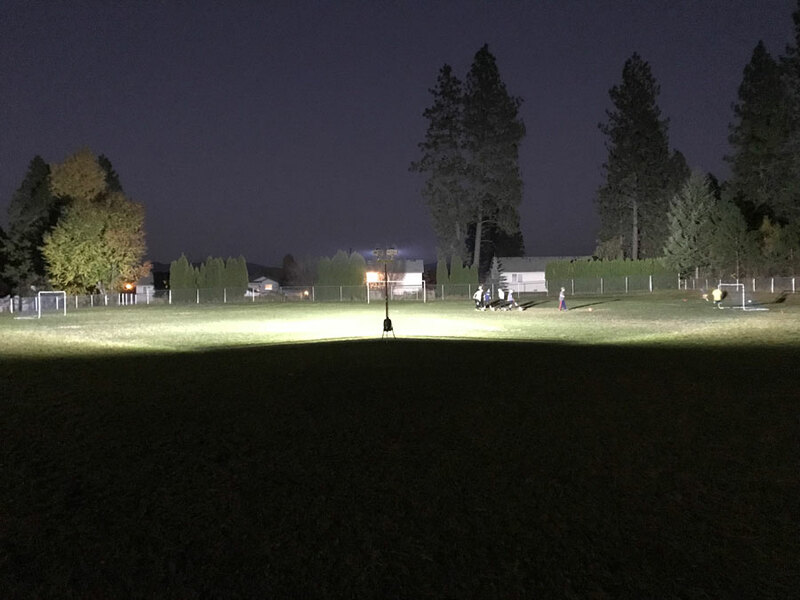 Until now, they have been stuck renting tow-behind trailer-mounted generators with light masts (up to $1000 a month), or struggling with with inadequate, low-output, difficult work lights. 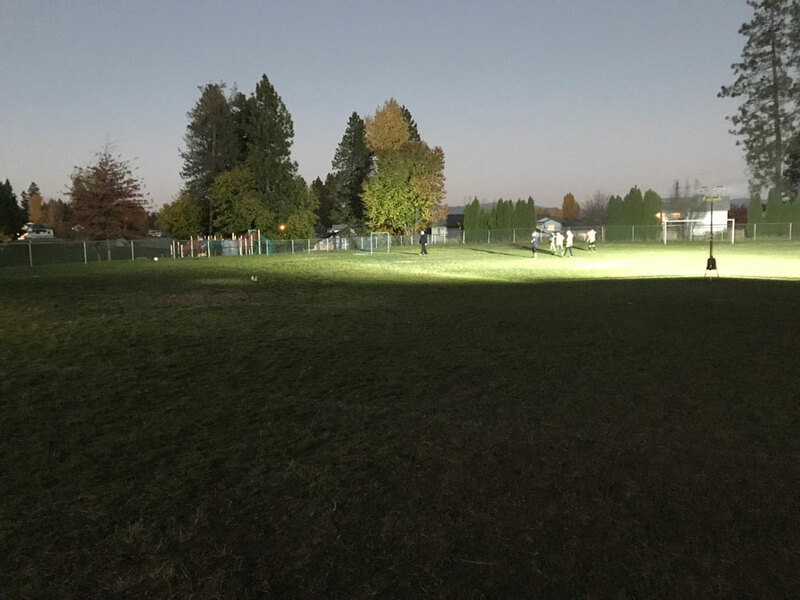 Conclusion: Lentry Portable Lighting Systems are good alternatives to large commercial lighting systems and economical long-term investments for sports associations needing to light remote areas that are often inaccessible by vehicle and without power. 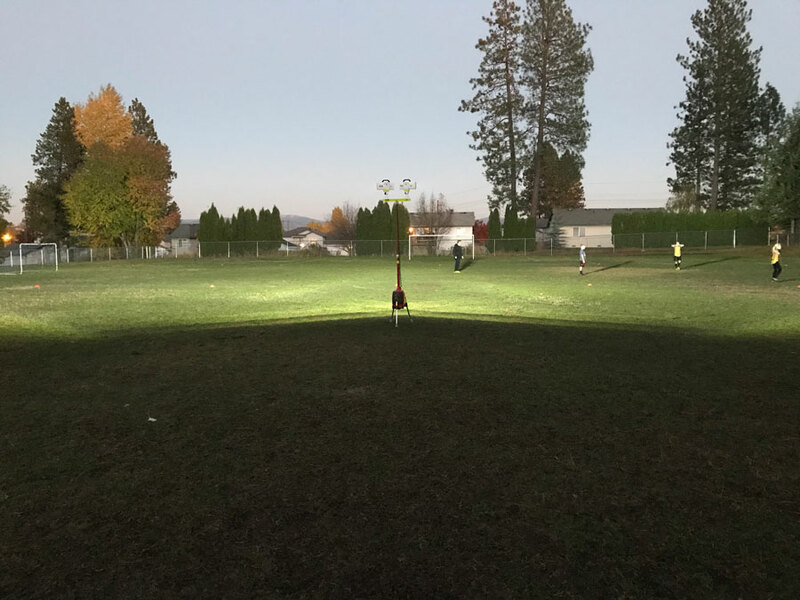 This is a “before picture” of players still struggling to see despite having 9 work lights spread around the field! 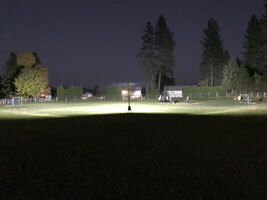 An “after picture” in which the field is lit by the light of one Lentry LED Light. 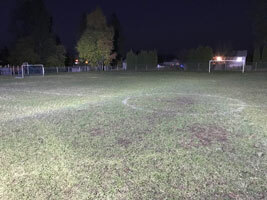 Having tested the lights on several unlit soccer fields at night, we can confidently recommend lighting many fields and sport activities using a Lentry Light with one or two extra-tall height V-Spec or V-Star LEDs. 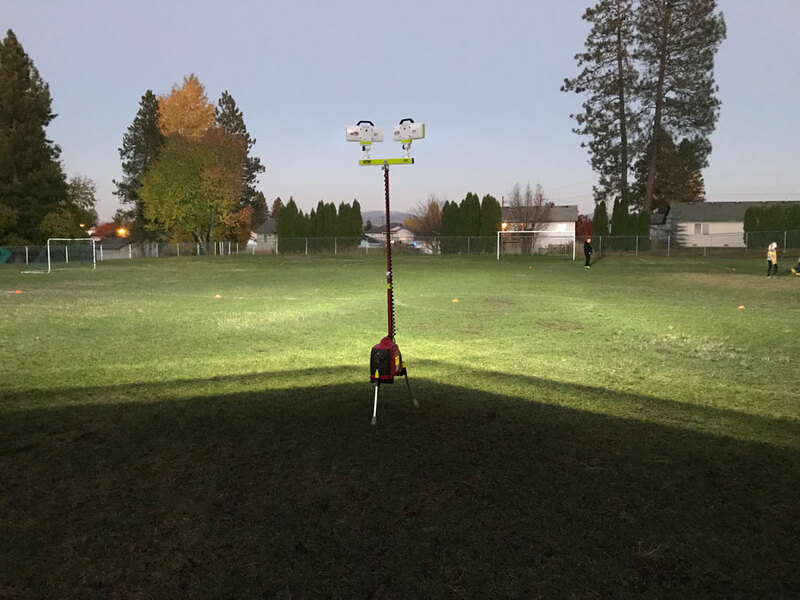 James feels a single V-Spec or V-Star LED does very well on half a field and that two LEDs or the two-headed LED would sufficiently light an entire field. Two LEDs give you the advantage of aiming in opposite directions and placement in the center of the area instead of at one end. James found that positioning the portable light at one end of the field, near one of the goals, tended to blind the goalies. Instead, he positioned the unit near the center of the field and moved it 20 to 40 feet back, so that the flood and spot lighting fell on the field. 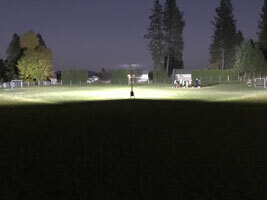 For the tests and shown in the photos, James used our shop model which has the 1000-watt EU1000i generator. 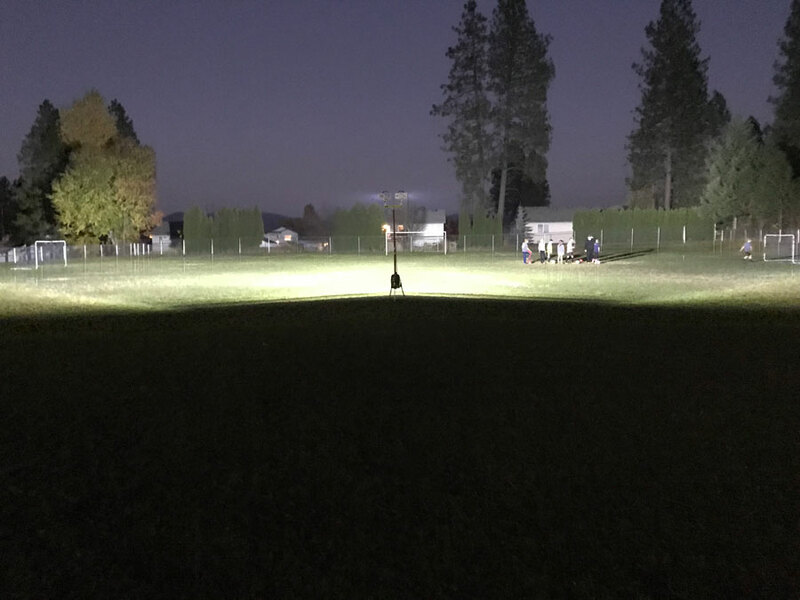 Please note that while the smaller generator may be sufficient to run the 2-Headed V-Spec LED light head, it is only available on the 2200-watt model 2TWSPX-C with the heavier generator. The larger, heavier generator is needed to counter the heavy light head. Click images below to open larger versions. Hit your back button to return. 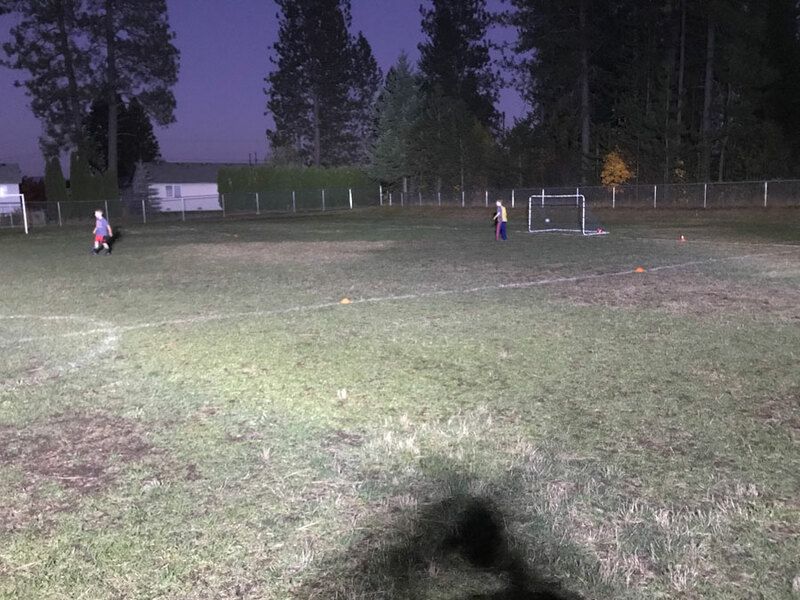 Photos above were taken by James during his demo at a junior league practice. 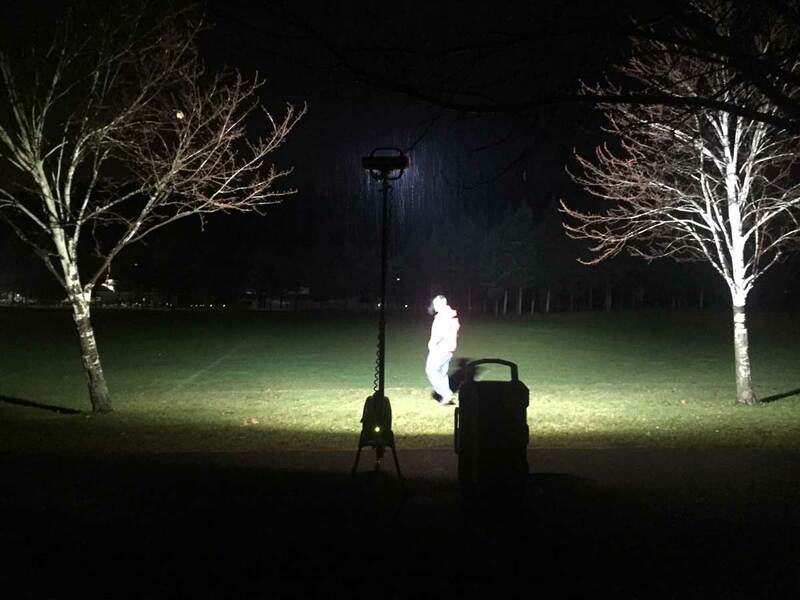 Below are photos Joan took during her demo in the pouring rain. 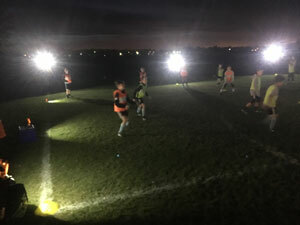 For sports lighting, we recommend Lentry Light models with extra tall (XT-height) LEDs. 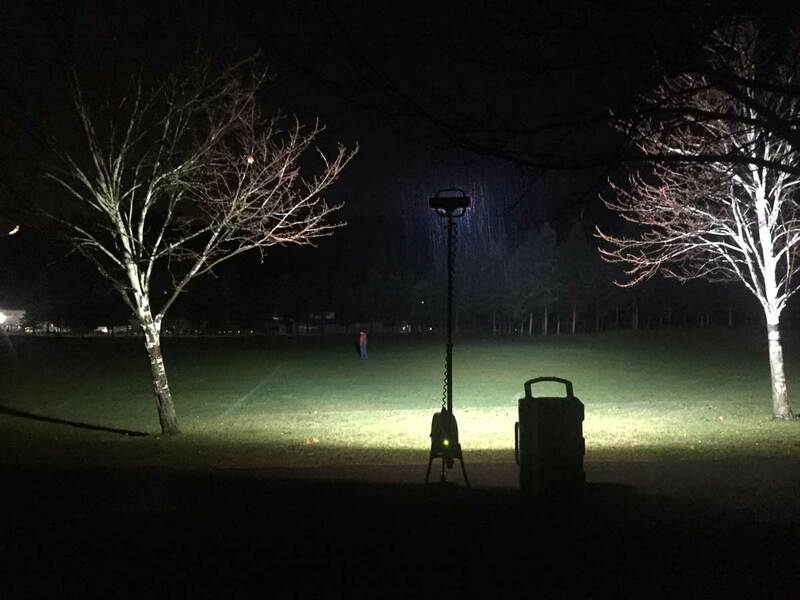 Lighting a soccer field, in the pouring rain, with Lentry Light Model 1STARX. 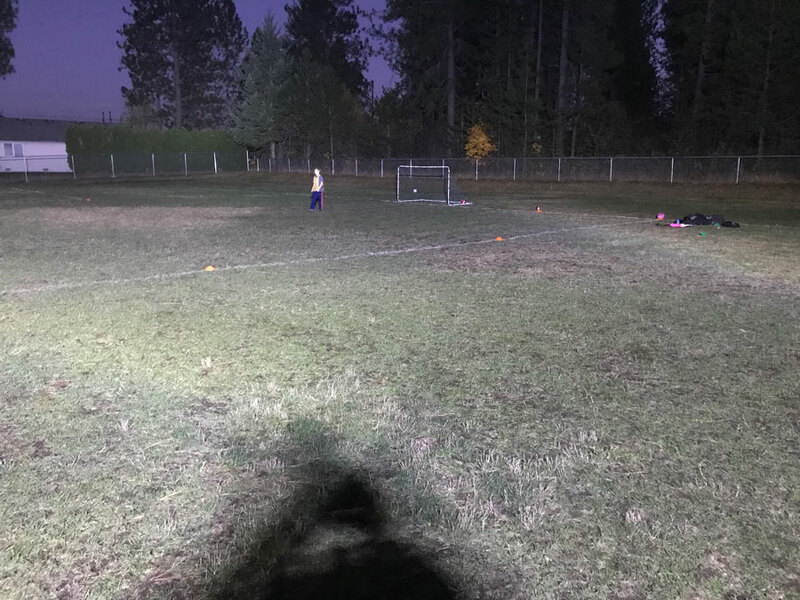 The man in the distance (above) felt he could see well enough to play soccer while this far away from the remote area light. Note that the Lentry Light was unaffected by the POURING rain.